When an insect bite or an allergy to some cream which you had applied sparks off an itch, you promptly feel an urge to scratch that area to get relief. Has it ever occurred to you as to why scratching an itch feels so good? Researchers do have an answer. A study conducted by Dr. Gil Yosipovitch, a dermatologist from North Carolina, has revealed that scratching temporarily numbs the part of the brain linked to unpleasant thoughts and memories. And the more intensely a person was scratched, the less activity they found in these areas of the brain. Dr Yosipovitch explains: It’s quite possible that scratching suppresses the emotional components of the itch and brings about relief.” It has also been found why one scratch often begets another. Scratching also raises activity in brain regions related to compulsion – so that explains why we sometimes can't help but feel like sitting for hours and hours just to scratch. 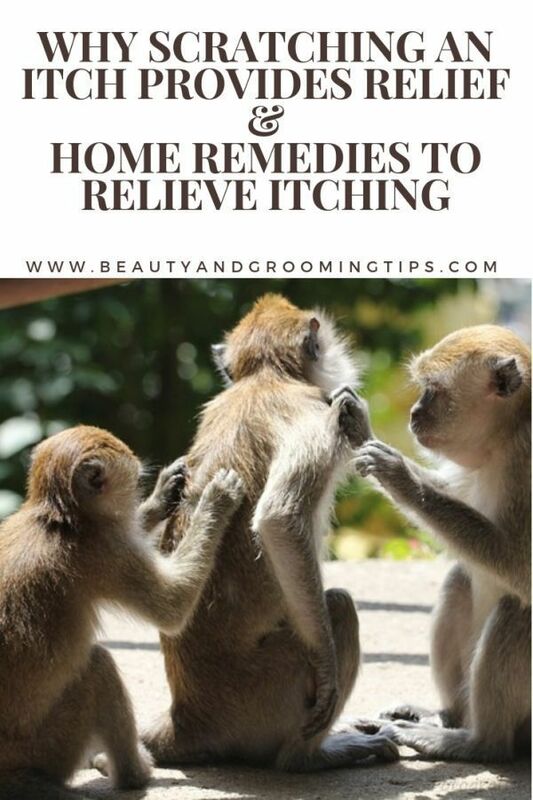 By the way here are some effective home-remedies when you are bugged by this problem of itching. Instead of scratching yourself to death, try some of these. Very helpful in easing symptoms of moderate to severe itching. * Tamarind (Imli) pulp which is a common item in most South Indian kitchens is a life-saver in cases of moderate to severe itching. Soak the dry tamarind pulp in water for a few minutes and then squeeze out its paste to apply on the affected areas. This provides almost immediate relief. * Sandalwood (Chandan) and Red sandalwood (Rakta Chandan) pastes can also be applied on the affected areas to soothe itching. * Grind fresh neem leaves and apply on the affected parts. Paste of Tulsi (Basil) leaves is also beneficial. * You may also collect leaves of neem, lime/lemon, Tulsi (Basil) and Bael and put a handful of each of these varieties in water and boil. Drain this decoction and mix it with lukewarm water in your bathtub. After your bath, dry yourself with a clean towel and sprinkle sandal dust all over your body. * You may grind guava (Amrud) leaves with a teaspoon of turmeric (Haldi) powder into a smooth paste and apply it on the affected parts. * You can also mix equal parts of powdered Ajwain (Bishop’s weed/thymol seeds) and turmeric powder in water and apply this paste. * Rubbing pure neem oil (coconut/olive oil if neem oil is not available) also helps to relieve an itch. * Application of pineapple juice might also help. * Mix powdered Ajwain (thymol seeds) with onion juice and apply it on your skin for relief. This also helps with rashes. Thanks for contributing this post to this week's Carnival of Family Life, hosted at Modern Sage -- Practical Living Blog. The Carnival will be live tomorrow, so please stop by and peruse all of the wonderful articles submitted this week! Take a bath in one can of evaporated milk; you can add other combinations such as oatmeal, baking soda etc. The milk works well to soothe the itching.Apply Aloe Vera, cod liver oil, lemon juice, vitamin E oil, wheat germ oil, or witch hazel tea to the itchy area.Take burdock, chickweed, goldenseal, plantain, or yellow dock in capsule form.Cornstarch helps relieve itching. You can pour some into your bath water or dust it onto your body.Scrub the affected area lightly with a pumice stone. Then wash with soap, apply rubbing alcohol, and dab a thick layer of Vaseline over it. This will provide relief from itching. Diet can play an important role to combat itching that result from food allergies. If you have identified foods that cause itching, it’s best to avoid them completely.Increase your intake of Vitamin C, beta-carotene, Vitamin E and zinc through diet by having foods rich in the above mentioned vitamins and minerals. It might be a bit of fungus. Wear gloves, if need be, to keep yourself from opening your skin by scratching with your nails. Oatmeal. Add 1 to 2 cups finely ground oatmeal to a warm bath (not hot or you might have breakfast for the next month in your tub) to ease your itches. Add five grams of camphor in 100 grams of coconut oil and mix in a glass bottle. Close the bottle with a tight cork and keep in the sun till the camphor gets dissolved in the oil. Apply this oil daily on the whole body before bathing. It is an effective home remedy for dry itching. You can try a couple of things. Change your laundry detergent to something that is for sensitive skin it should be perfume and dye free. Also try soap or body wash with colloidal oatmeal in it, like Aveeno. And you may want to try a skin lotion with colloidal oatmeal too. Aveeno is good for that too. Sounds like either the detergent is bothering your skin or you have dry skin. Aveeno is good for dry skin or just plain itchy skin. It does wonders and I swear by it. And just about every grocery store or big box store like WalMart or Target carries it. I hope this helps. Itchy skin can be maddening. I bless the day I found Aveeno. If your skin is affected from the itchy and hot symptoms, you should use sandalwood oil to make it cool.